As the first update after the long leave, this version includes 14 bug fixings. Although no new feature is provided, the following news is still exciting: A brand new ForeUI document is available! As usual you can launch the document via the menu “Help->Online Help Content”, that will bring you to the ForeUI document page. But you will see the content of the page has been changed completely. 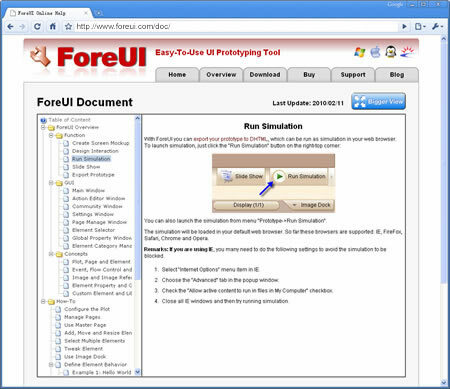 The new document introduce all things about ForeUI systematically. No matter you are beginner or advanced user, you will find the document very helpful. 14 bugs have been fixed in this update. Bug_0158: “Change State” action is not listed for TextEditBox element. This version also include a slight enhancement: move the “From Image File…” menu item to top when choosing image. This is requested by Ulrich and we think it is reasonable: moving cursor to the bottom may trigger the icon libraries dispaly one by one, which is annoying. ForeUI V2.10 is released today! From this version ForeUI supports keyboard event handling, it is very useful feature when making prototype for game or other applications that need to manipulate with keyboard. This version also provides enhanced Text element and more (details below). Current_Key_Code: The key code of current pressed key. Here’s a key code table. Ctrl_Key_State: Value will be 1 if the CTRL key is currently pressed, otherwise 0. Alt_Key_State: Value will be 1 if the ALT key is currently pressed, otherwise 0. Shift_Key_State: Value will be 1 if the SHIFT key is currently pressed, otherwise 0. Focused_Element_Id: The id of element that currently has input focus. 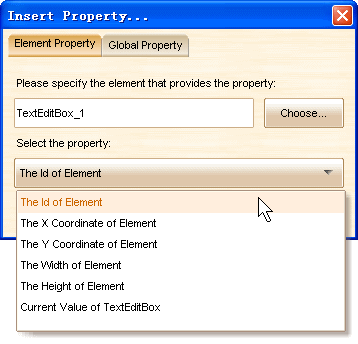 Also we can retrive the Id of the element as an element property, thus we can detect if the element has focus by comparing its id and the Focused_Element_Id system global property. Here is a simple example, a message box will popup when we press the ENTER key within the text edit box. It can be used when we need to simulate the data submit process. The executable will be “launch.bat” in Windows, “sh launch.sh” in other platforms. The parameters in red are required, parameters in green are optional. Parameters (except source plot path and target directory path) are in -Name:Value format. Switch page in simulation, do not hide current page if the target page does not exist. Shows multiple menu items to launch action editor if right click on multiple elements. Make text content in Table element unselectable for FF, Chrome and Opera. Tool windows can be resized. Allow reseting all parameters in settings window. Bug_0140: The “Auto resize element after editing its content” option does not take effect when adding image into button. Bug_0143: Copy element that contains “Switch Page” action and paste it to new plot, the new plot will contain the old plot data.